[spanish] how do we know that they started to block blogs' profiles in google+? ha. for those of you who don't usually follow us here's the particular love story we had with our beloved google in the last month. google launches google+ with a design extremely similar to this blog, as we told you here (in a humorous way but anyways...). all fine until here. we created a page for this blog in google+, and in order to push the new platform introduction we decided to invite people to google+....we invited like 300 people. all fine until here. without google informing us as the alert that many people mentioned was not available at the beginning of google+, we decided to delete the photo album that contained the blog' pictures and that google had automatically added to our new google+ profile. we just wanted to delete the pictures in google+, but google decided that our secret intention was to delete all pictures in the blog so they deleted the blog picasa album and and this blog was left with no pictures. first letdown. we asked for help to google support and they not only ignored us but also removed our petition from their google help forums. we found out that we were not the only ones with this problem: link 1, link 2, link 3, link 4. so it looked quite obvious that google+ had a problem, and google didn't seem to care at all about it. second letdown. google finally implements the alert when you delete pictures in google+, informing that you are also removing them from picasa and blogger. 3 weeks after google+ launch and with nobody-knows-how-many pictures lost. and google tells this in a forum without even saying we are sorry. third letdown. - all good positions in search engines are lost: so if you search now "ojos de ella fotos abc" the search engines will take you to the old URL, which will return a 404 not found error. - all external web links are lost, for instance menéame o any other blog. they also redirect to a 404 - not found error. - traffic stats are messed up and same with some widgets like popular posts and so on. this behavior, which kills your blog, is not documented in the import/export blogger tutorial. only when it happens to you you discover that it works like that by default. google doesn't warn about anything! fourth letdown. we desperately asked for help to google. nodoby replies, although now they haven't removed our request, at least. fifth letdown. 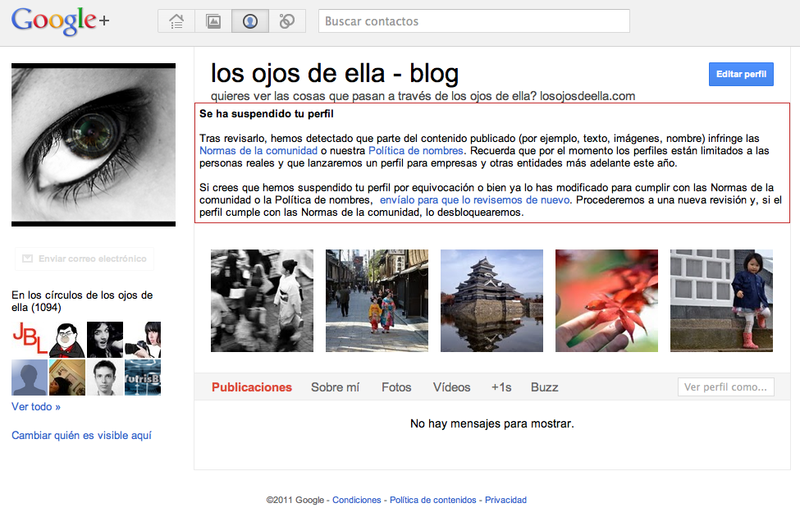 google blocks our blog profile in google+. sixth letdown. here you can find google's staff from mountain view's visit to our blog to verify that we are actually not a real person and instead a huge corporation with 557 million euro of expected profits in 2011.
as time goes by, google looks more and more like microsoft and their monopoly in the late 90s. but we are not the only ones who believe this, only in 2011 the cnn begins to have doubts about google's business model and their worse performance in revenues, techcrunch asks if google will manage to get its mojo back, it's now microsoft who files a monopoly complaint against google and the US Federal Trade Comission has begun to take a closer look to google's business. monopoly, as everybody knows, brings a decrease in product quality, the lack of customer support, lack of innovation, etc.